Leapin' Frogger! Home may look like it's only a hop, skip, and a jump away, but looks can be deceiving. First, there's a dangerous highway to hop across, full of fast-moving cars and trucks. Then there's a swirling river to leap, full of frog-eating creatures. How's Frogger going to get home safely? By letting you hop him on his way. 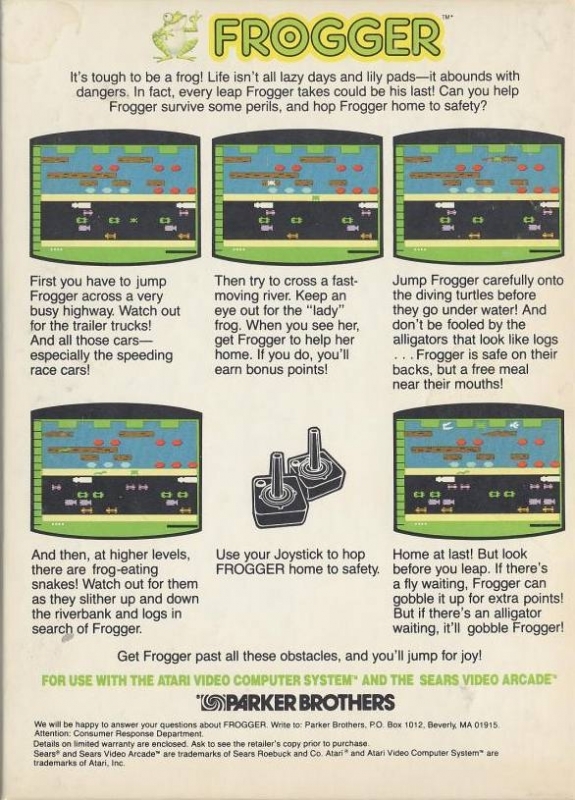 Guide Frogger safely through this perilous journey, and you'll jump for joy! The object of the game is to hop as many frogs to safety as you can--and to score the most points along the way! This is actually a fun game for the 2600. Those old games are so fatalistic, going in you know your going to end up dead. Winning is holding off death longer then the time before, but you will die. This is not only a classic, but one of the very few games my mom ever played more than 30 seconds. And it had a awesome commercial too.